This was the best day of skiing I’ve had in about a decade. There was about 4 inches of fresh snow, we had clear skies almost the entire day, but it was cold. The summit started at 3 degrees Fahrenheit and warmed up to 8 degrees. But the best was when a chair opened up around 1:30 or 2pm that hadn’t been opened for a couple of days. That gave us fresh tracks on what would normally be groomed runs: up to 2 feet of fresh snow in some spots. The photos and videos show Haakon, Mike and me having a great day! 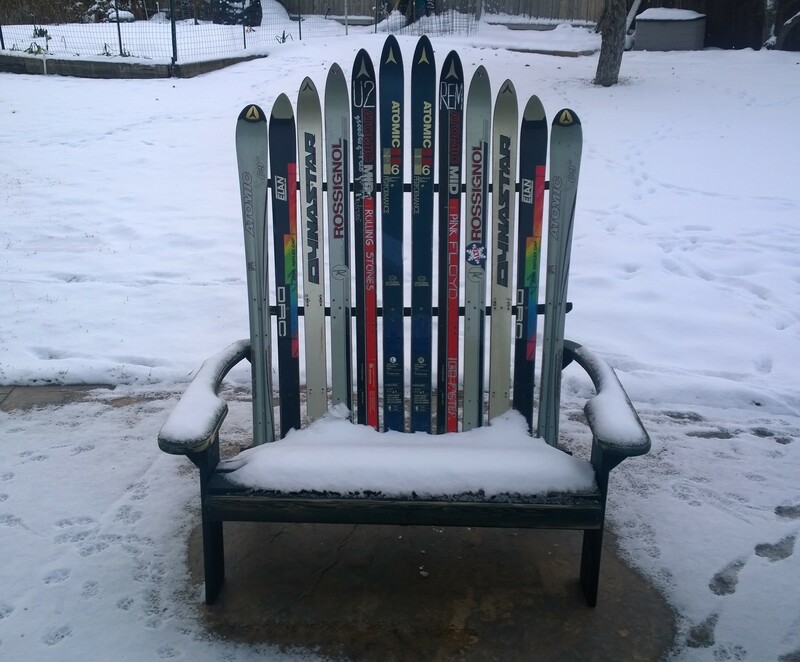 Some of you may recognize the skis on the middle of this chair my brother built. The blue Atomics used to be on the outside of our houseboat in Fremont. 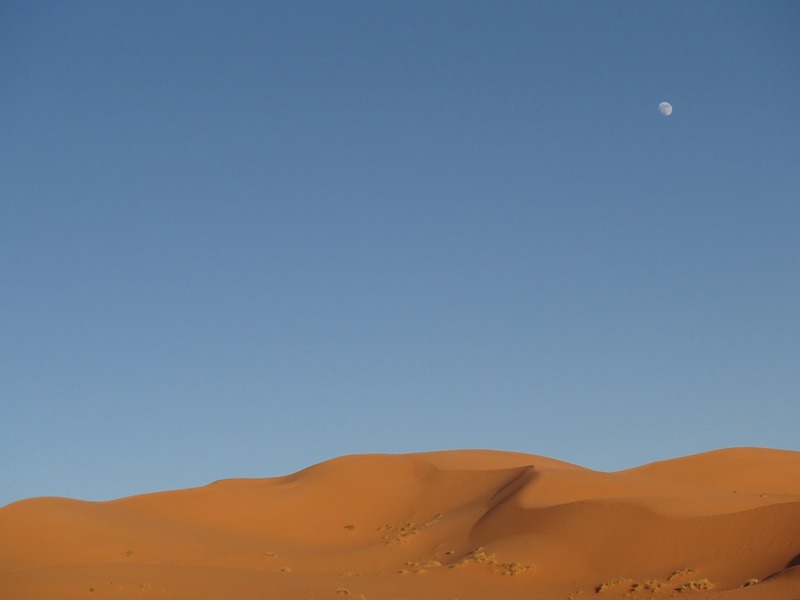 I can now say I’ve ridden a camel into the Sahara desert, climbed up a sand dune and looked out across the dunes under bright sunshine and under bright moonlight. I have a short video of riding the camels. I can also say I’ve spent a sleepless night in a nomadic tent as I listened to our camels lightly snore. No video of that. Technically, I rode in on a dromedary, which is a camel with one hump instead two. They crap a lot when walking. None of us slept in the desert that night, because our nomadic tent flapped loudly in the strong desert winds. All night. At least none of us got spit on by our camels and drumming at night with our Berber friends and guides while gathered around a camp fire was fun. The video of that is much more about the audio. 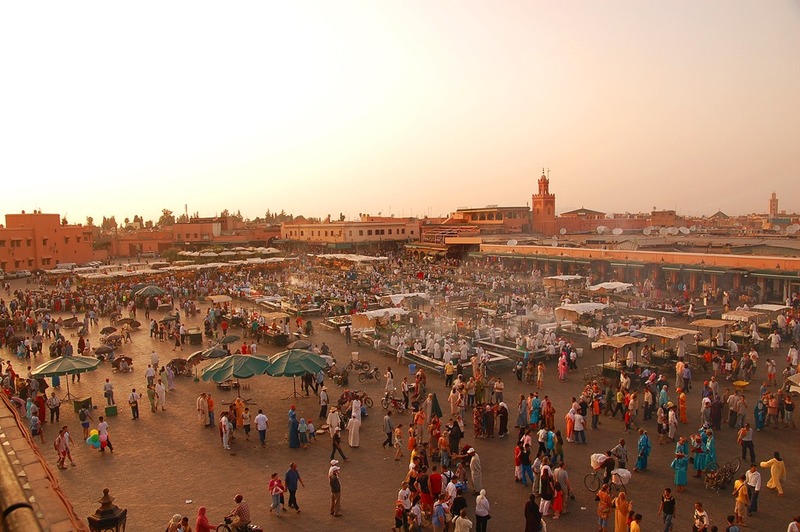 … To back up, this was a road trip through Morocco with friends Kris, Donna, Char, LuAnn, Laura, plus Lorie and I. We were let by our guide Abdellah and our driver Abdul Karim. 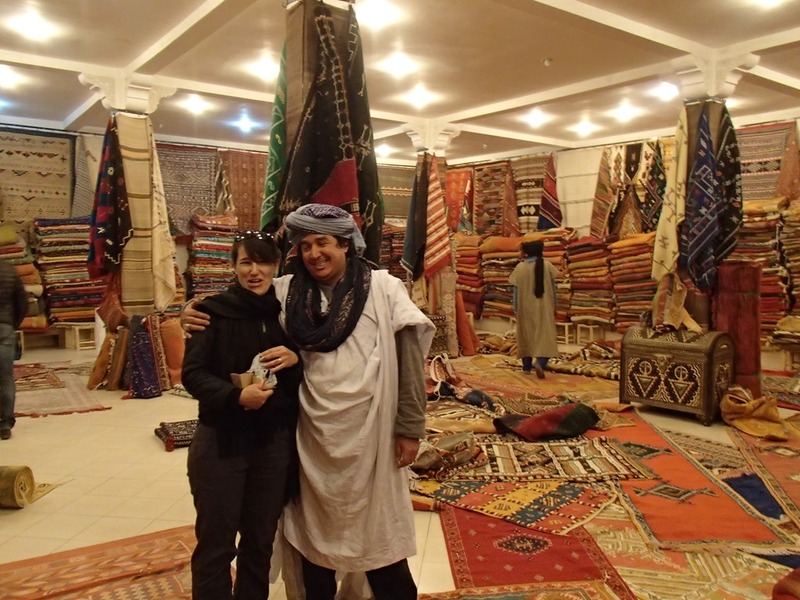 We saw a variety of Moroccan life, learned about the Berber people, and stayed in their guest houses and hotels. That includes the local cats and dogs that hang around the hotels too. We also learned a bit of Moroccan history and a few Arabic words along the way. Thankfully, French is spoken by most people and English worked much of the time too. 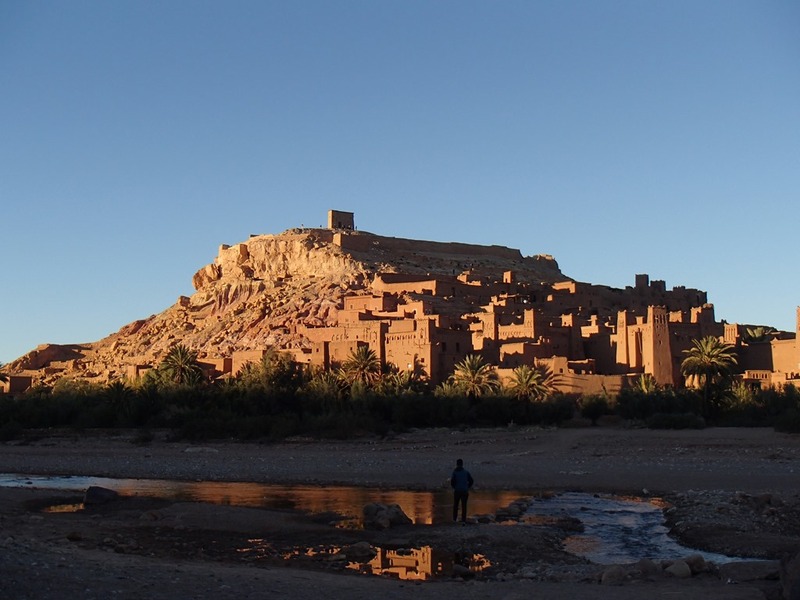 One very interesting place we saw was Ksar Ait Ben Haddou, which is a UNESCO World Heritage site and where many movies have been filmed. We drove through the mid and the high Atlas Mountains, but thankfully never hit any snow since we weren’t prepared for that. We saw mountain towns and desert towns, all built in either cinder blocks or mud with bamboo roofs. We visited a "Berber pharmacy" (think herbalist or a natural pharmacy, not chemical) and visited a shop with rooms full of Arab, Berber and Jewish artifacts from the region. The main guy there is one of the best salesman I’ve ever met. Our friends bought carpets from him, but he and I couldn’t agree on a price. After many days of driving, Lorie and I opted to drop out of our tour two days early and stayed at a nice riad in Marrakech instead of heading to the beach. It was a smart move, since it was quite, relaxing, they served us great meals, and we were close enough to walk to the markets and retreat back to the road for a break. In Marrakech, we saw snake chargers, endangered monkeys on leashes, streets filled with cars, scooters, donkeys pulling carts and horses pulling carriages with tourists. The souks are packed with everything for sale, a bit like a maze, and fascinating. Check out all the photos, and pay attention to the file name to get a bit of context.